Please Note: This ticket is not date specific. It is valid for any SIX days, within a 14 day period, starting from the first day of use. 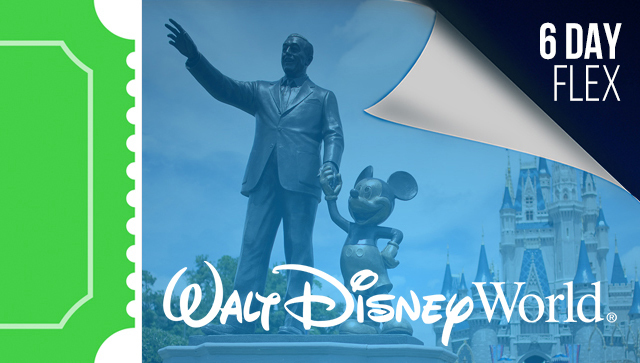 *FOR $25 MORE UPGRADE TO THE PARK HOPPER® PLUS WHICH INCLUDES 2 DISNEY WATER PARKS AND MORE. Important: PICK EITHER THE PARK HOPPER® OR THE PARK HOPPER® PLUS. DO NOT PICK BOTH OPTIONS. THE PARK HOPPER® PLUS HAS ALL OPTIONS INCLUDED IN THE PARK HOPPER®. This option adds one more day to your valid use period.